So you’ve gone to a pumpkin farm, enjoyed your fill of apple cider doughnuts and roasted corn, picked out your pumpkin, and sat it down on your front porch. Excellent. Now for one of the most important parts of Halloween: the creation of the jack-o-lantern. 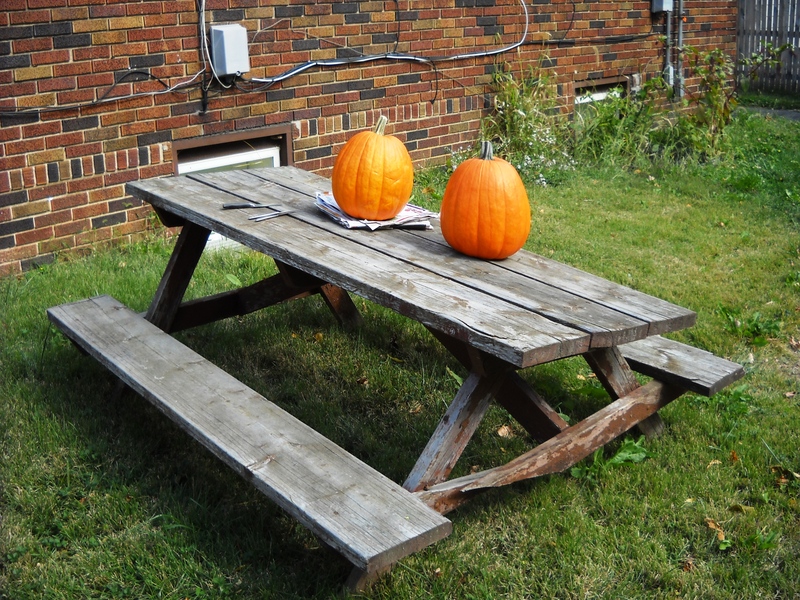 Set your pumpkins down on a surface covered with newspaper (or a dilapidated picnic table, pictured left). What you’ll need: a marker, a big metal spoon, a bowl for the guts, and some sharp knives. Everyone knows how to carve a pumpkin: cut around the stem, pull off the lid, scrape out the guts, and start slicing. But some people get creative, pulling the guts out through the mouth so it looks like the pumpkin is vomiting, doing artistic designs that involve layered cuts, etc. You can print out designs from the internet if you’re having trouble creating one of your own, but where’s the originality in that? Keep searching for a match. And get a sharp utensil. You also have a pencil. Around the long brown stem. For the seeds: that’s where you’ll put them. You may have to make cuts. It’s time to draw the face. That the knife will trace. Or scowls (to scare your foes). And add to festive fear. Somewhere it can be seen. And wish all a happy Halloween. 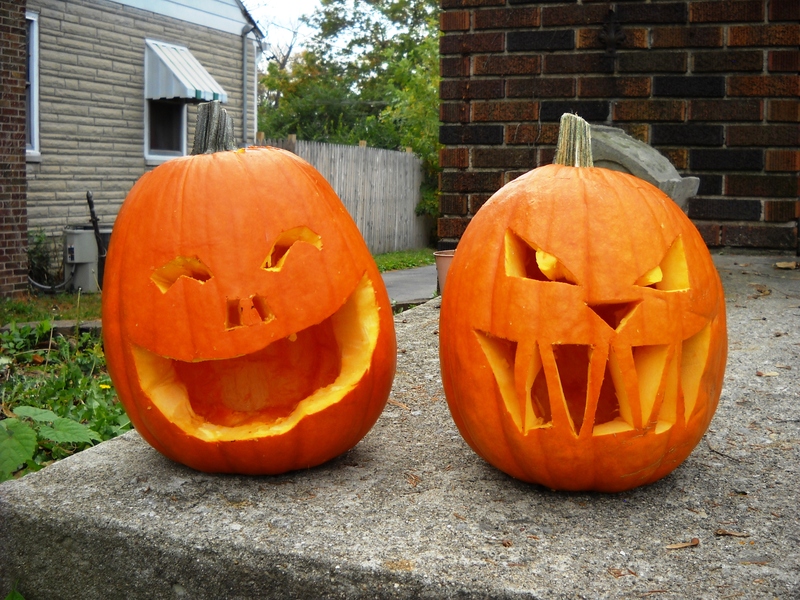 This weekend’s pumpkin carving turned out one happy pumpkin (my boyfriend’s) and one scary pumpkin (mine). Once it got dark out, we lit up some heavy-duty glow sticks and put them inside for a nice eerie effect. Unfortunately, the psycho squirrels around Butler’s campus decided they were hungry for some pumpkin and started munching on my jack-o-lantern’s left eye. Ouch! Looks like it’ll just have to be a zombie-lantern. Tip: try coating the carved pumpkin in bleach: not only will it keep away the critters, but the bleach will help preserve the pumpkin for longer so you don’t have decayed mush come Halloween. Don’t forget to separate the seeds from all the guts, spread them on a baking sheet with some olive oil and sea salt, and roast yourselves some delicious pumpkin seeds to much on while you enjoy your creation. 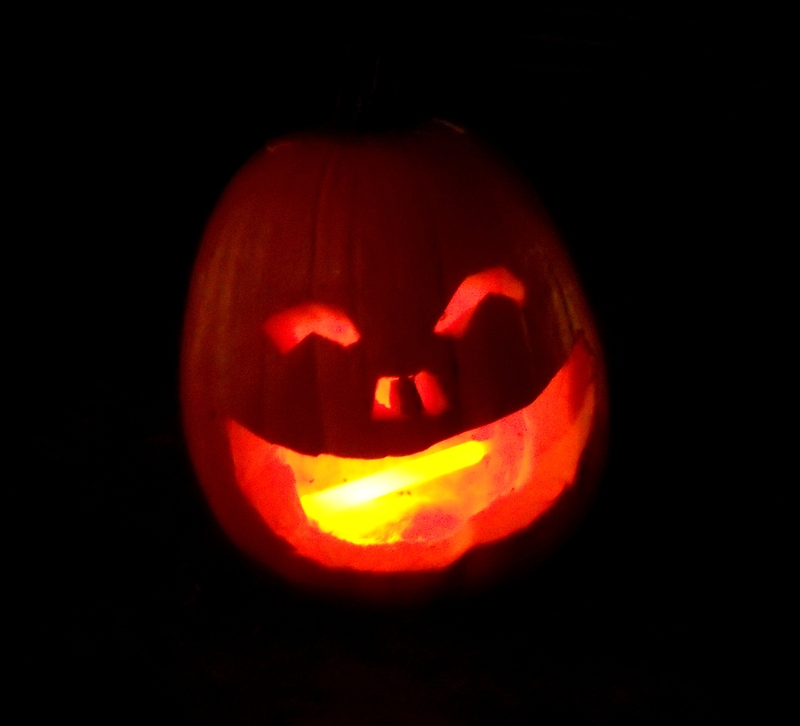 The “happpy” pumpkin smiles like Dexter…. 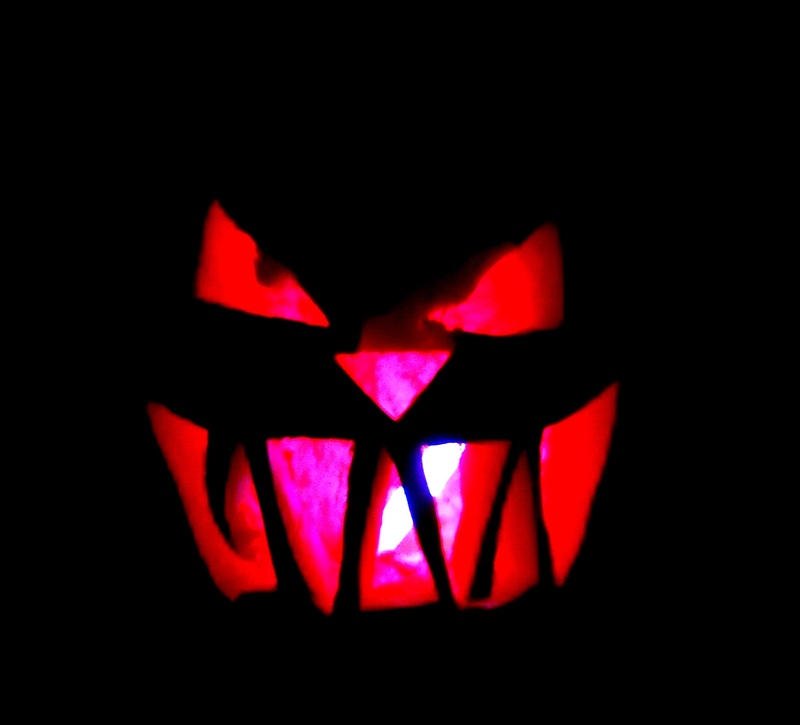 Love the light pulp “eyeball” of the scary pumpkin. Very Tim Burtonesque!